French cuisine seems, at first blush, a long way from kosher cuisine. Butter never seems very far from the meat, and both pork and shellfish feature prominently. Nowhere, perhaps, does French cuisine seem likely to be less kosher than when it comes to charcuterie. But chicken liver terrine puts the lie to that. After all, traditional recipes do not call for the proper kashering of the livers (making them kosher) and, on the other hand, demand butter. But it need not be so. Those traditional recipes cook the livers in a sauté pan, so why not grill (or roast) them to properly kasher them? And butter is delicious, no doubt, but there may be no tastier fat on the rock than chicken fat (schmaltz). Those two steps take classic French chicken liver terrine and make it not just kosher but, if anything, better. Kasher the Chicken Livers. Season the livers with salt and pepper. Broil or grill them for 2-3 minutes until the inside of the livers are no longer brown but rather pink. Caramelize the Onions. In a large sauté pan, cook the onions with 1/4 cup of the duck fat or schmaltz, stirring frequently, for 10 to 15 minutes or until the onions are browned and begin to caramelize. It will take 10 to 15 minutes. Once the onions are browned, scrape them onto a paper towel-lined plate to drain. Add the port and boil over high heat until it’s reduced by half. Add in the cognac and boil for 10 seconds. Make the terrine. Add the hard boiled eggs to the bowl of a food processor fitted with the “S” blade and pulse a few times. Add in the onions, livers and the port/cognac mixture in, then add the cooked livers vinegar, cayenne, and the remaining 1/2 cup melted chicken or duck fat, then puree until smooth. Taste, and adjust with salt and pepper. Pass the mixture through a fine mesh strainer to get an even smoother texture. Chill the Dish. Transfer the mixture into four ramekins and top with a thin layer of the melted duck fat or schmaltz. Refrigerate until the terrine reaches the desired texture, about an hour at the least. Garnish the Dish. 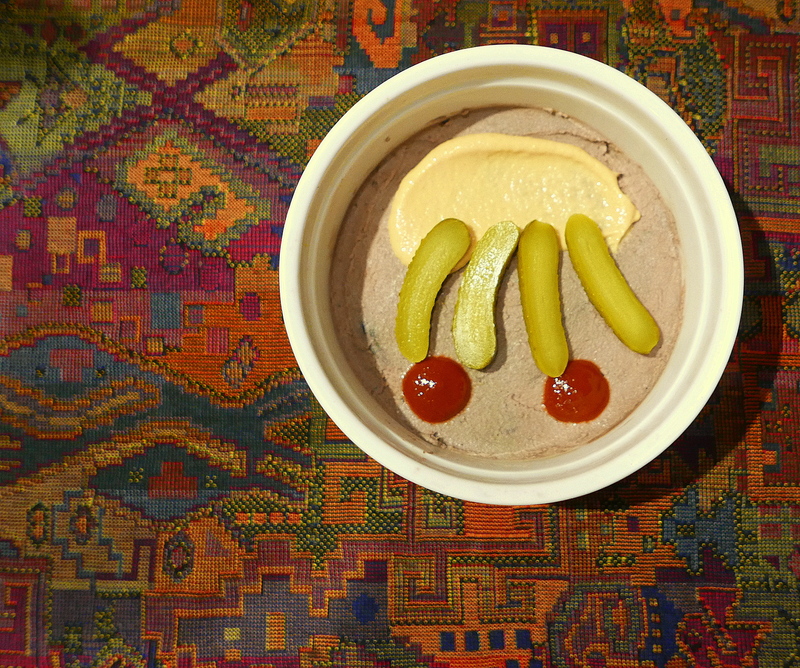 Arrange two halves of cornichons, a dollop of Dijon mustard and dots of sriracha on top of each ramekin of terrine. Serve with slices of French baguette and, if you like, an arugula salad.